Now you can grow your own citrus trees right here in the UK! Yes, you can grow fresh oranges and lemons in the UK with this fabulous citrus collection! In winter and early spring trees are covered with luxurious, super-fragrant blossom. Fruits mature and ripen over a whole year or so, so plants can have fruits and flowers at the same time. Grow outside in the summer and bring indoors in winter. Supplied as 20-30cm (8-12in) plants in 9cm pots, ready for growing on. Grow your own delicious citrus fruit right here in the UK with this easy-grow Orange & Lemon Tree Collection. 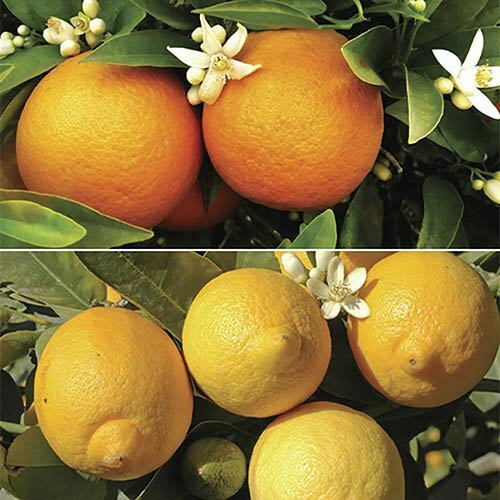 Mature plants will produce delicious fruits, and are winter hardy to -5C - that's right this pair of Orange and Lemon trees will grow and fruit perfectly in the UK! The sweetly-perfumed white flowers contrast beautifully against the deep green citrus-fragranced foliage, and the fruits smell simply divine - plus they're packed full of vitamin C, they're delicious and good for you too! Both of your trees arrive as young plants, 20-30cm tall including their 9cm pots, and are ready to grow on, making them a great value way to get your hands on a pair of superb citrus plants. Lemon 'Citron' - Hardy down to -5C! - Sweetly scented blossom in late spring. - Full-size fruit from August onwards. - Perfect for drinks and cooking. Orange 'Calamondin', also known as 'Panama Orange'. - Hardy down to -5C! - An attractive dwarf orange, a cross of the tangy kumquat and more familiar zesty tangerine. - Packed full of vitamin C. Height to 150cm (60in). Grown from cuttings, these Citrus plants are reliable and will produce fruit. We recommend using our Soluble Citrus Fertiliser to ensure your trees grow into big, healthy specimens and, most importantly, bear lots of juicy fruit!